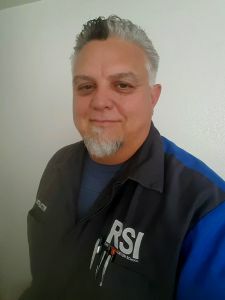 Alan, aged 51 and an Arizona native, is an Instructor at The Refrigeration School (RSI) in Phoenix. Alan teaches the 6th Phase, which focuses on residential comfort systems (residential heating & cooling) including gas furnaces. Alan has been in the HVAC field for about 12 years. Thanks for speaking with us Alan. So, when did you start teaching at RSI? I’ve been instructing here for a little over a year and a half. Not that long – although I did go through the school as a student about 10 years ago. So, you got into HVAC in your late 30s. What did you do before that? I was a Corrections Officer with the Department of Corrections in northern Arizona. I did that for about 10 years. Before that it was mostly running forklifts in warehouses just unskilled labor. Why did you leave corrections to go into HVAC? Honestly, I got tired of being a babysitter; but instead of kids misbehaving it was people who could potentially kill you. It was stressful, and there was no reward. The last couple of years I ran about ten different work crews. I had about 200 inmates working for me. That was probably the best time because I had projects, deadlines, and people that wanted to work and would get the job done. It’s crazy because they were inmates, but even if they were only getting paid 15 cents an hour, good jobs are valuable so they worked hard to keep them. It just got old; the politics, the danger. I was on sick-leave for almost a year, and during that time I had a lot of time to think about it, and I did not want to go back. What made you decided to go into teaching? It was actually all by accident! I was living up in the White Mountains in northern Arizona and work up there was getting a little slow. I actually contacted RSI just to update my résumé to start looking for work, possibly in Tucson because my fiancée is there. That’s when I discovered they had a position open. I did a little talking to the Director, and ended up driving down that week for an interview. Before I even got home, I was called for a second interview. So, I just turned around and came back down the mountain. Before I got home from the second interview, I was offered the job and I couldn’t pass it up. No, other than teaching a little beginning guitar in junior college! I was unsure about it to be honest. They let you train on the job at RSI. Once you feel comfortable, they let you start taking classes. They probably thought I was going to make a career out of training. I was there for a while because I was just not sure about it. But once I did it, I can’t even tell you how rewarding it is to help people. Is that what you enjoy most about teaching? Yes – making a real difference in peoples’ lives. There’s nothing better than a student coming back after they’ve graduated, proudly wearing a uniform, knowing they have a good job, to tell you, “thank you.” That’s kind of like a paycheck for me in a sense. There’s nothing better than that. A rock star! My daydream was to play on a stage. I guess it’s between that and working on cars. I’ve been working on cars in some sort of way since I was 12 year old, so that’s always been an interest. In fact I had plans to go to school for that out of high school, but I got married instead and changed my plans. Do you just teach, or do you do HVAC work on the side? I do a little, but I really try not to do too much service work. My body’s getting to the point where it doesn’t like it. I enjoy it…but my body doesn’t necessarily. I’m hoping I can just teach until I retire. I don’t share a lot of my outside life, so I guess my photography is something they may not know about. I started doing a lot of landscape and wildlife photography, making and selling calendars. A couple of my daughters do photography now, and they do more portrait and wedding type stuff. I’ve done some jobs with them, so I’m transitioning into that. I was a musician for many years too. I played guitar in a few different bands over the years, mostly classic rock and a little bit of blues. I still have a couple of guitars at home, but that’s about it now. If someone is thinking about going to school to learn HVAC, why do you think they should choose RSI? I’m not familiar with how other places go about instruction, but I’ve been told that we have more hands-on time than other places. I know we have a lot of hands-on, and I know we have a lot of technicians who are now instructors. They’re not instructors who’ve just learned material to be able to teach it. We have instructors who are either still in the field, or have many years behind them in the field with a lot of firsthand experience and knowledge to share with the students. We have technicians who have learned how to teach as opposed to teachers who have learned the material of how to be a technician. If you weren’t a teacher and you could pick your job, where would you be? I’d be a photographer. Something good like Time Life, National Geographic, or even Arizona Highways. That’s a tough one. I’d like it to be my parents but I also wouldn’t mind meeting John Lennon. Maybe a table for four? That would be perfect! I’m going to go with my parents. I miss the heck out of them. What’s the best piece of advice you’d give to new students who are just starting? Two things…the first would be trust yourself. After I came through RSI as a student, I spent the first year out of school staring at equipment and second guessing myself thinking there had to be more wrong with a unit because it was too easy to fix. I’d spend time looking and looking and looking, thinking that can’t be it! You’ve just got to trust what you know. The second big thing is be honest. There are a lot of crooked people out there who will sell customers anything and everything because a lot of them now get paid commission. Being honest goes a long way. When I worked in the White Mountains, that’s several small communities all over, we didn’t advertise… but just our work and our honest work ethic kept us going all the time. My mind. Absolutely. It goes back to trusting yourself. Everything you learn is right there. You use it on every job. It stores memory; it stores data. You’re constantly upgrading it. If you can’t think logically and you can’t think smartly, if you can’t make the right choices, if you can’t operate safely, you can’t do this job. It’s the control center for all your communication and social skills – it’s everything. Thinking of your time in the field, what was your favorite part of the job? I’d like to say helping people, but to be honest I love winter and in northern Arizona. When we’d get nasty storms, that’s when I was happiest. It was hectic; it was hard, driving through snow and sometimes having to dig my truck out. Down here you have 12 hour summer days, up there you have 12 hour winter days – the wind blowing, snow blowing, extremely cold, miserable temperatures and I loved it – I miss it. I’m divorced but I have a tribe. I have eight daughters and one son, all aged between 31 and 10. I have a lot of gray hair…and it’s from each and every one of them! They all live down here. The furthest from my home lives 45 minutes away. That was one of things that was a big deciding thing in this job, because I was looking to go to Tucson. It’s great to be able to see them often as opposed to once a month. You get an unexpected afternoon to yourself. What would you do with that time? I’d probably take a quick drive up north. I’d take my camera, of course, and a fishing pole! If you were to tell someone, “Thank You” for making you who you are today, who would it be & why? I’m going to go with my parents. I miss the heck out of them. They adopted me as a baby, and they changed my life. They were such a great influence on me. My dad went to RSI as well, probably about 20 years ago. He was actually a machinist. When I was growing up he fixed everything. We didn’t call a repairman; I didn’t know of such a thing. My dad either made the parts or made something that would work. From a very young age I learned how to fix and work on things. When he retired as a machinist, he went to RSI and started his own business. That’s how I was first introduced to RSI, through him. My dad actually passed away on somebody’s roof working on an air conditioner. He had a heart attack. My mom was a woman that loved helping other people.